Snarf’s is my favorite sandwich shop in Boulder. In fact, the entire reason I started this sandwich series was because I felt I was making too much of a habit of Snarf’s and thought it in my best interest to branch out. 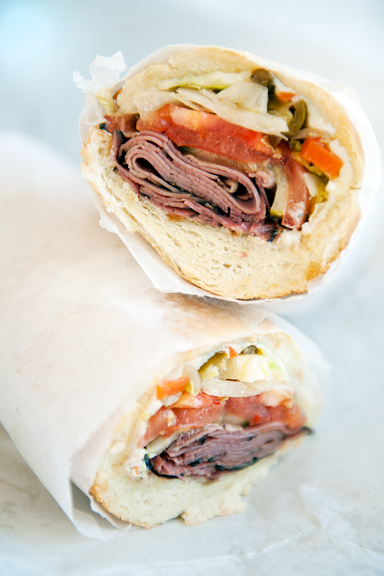 But I still return to Snarf’s time and time again, because I have a sandwich problem – nay, a sandwich addiction. There are two locations in Boulder to get your Snarf’s fix: downtown Boulder on East Pearl Street and East Boulder on Arapahoe and Conestoga (next door to Ozo Coffee). The shops assault you with brightly painted interiors, eclectic selections of music, and a bunch of hipsters behind the counters building your toasted sandwiches slower than you’d think humanly possible (but they are super nice hipsters). The typical scene at lunch is a line out the door – and that is just to place an order. Popular? Oh yes. It has to be if THAT many people are willing to wait THAT long for a sando. My buddy, Jason, digs on the feta and artichoke sandwich. I highly recommend it. I haven’t tried all of their sandwiches, because I keep coming back to my favorite: the hot pastrami and Swiss. I’m convinced that practically any of their toasted sandwich options will be spectacular because Snarf’s uses amazing bread. In addition to this perfectly crusty-outside-soft-inside bread, every sandwich comes with mayonnaise, mustard, hot peppers (these hot pickled peppers, I love love love), onions (I hold the onions), lettuce, tomato, pickles, seasoning, and oil. Choose Novice (5-inch for $5.50), Snarf’s (7-inch for $7.25), or Pro (12-inch for $10.50) on the regular toasted sandwiches. 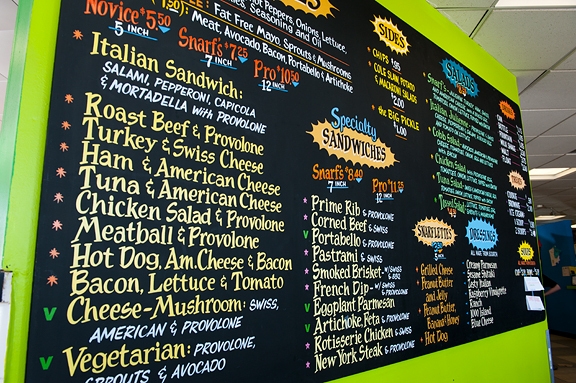 They only offer Snarf’s or Pro sizes for the specialty sandwiches. You can request fat-free mayonnaise, mushrooms, and sprouts. For $1.50 add your choice of meat, bacon, avocado, portabello, or artichoke. There are sides and salads on the menu too. I’m realizing from Facebook comments and other discussions that everyone seems to have their own Snarf’s favorite sandwich. I would love to hear what yours is! Pro tip: After waiting 30+ minutes for a sandwich the first few times, I’ve got both locations’ phone numbers in my smartphone. Call ahead and walk straight to the pick up window, bypassing the 2 dozen patrons waiting in line at lunchtime. Non-lunch times seem to take only 10 minutes. Where: Snarf’s is at two locations in Boulder: 5340 Arapahoe Avenue (Boulder, Colorado 80303) and 2128 Pearl Street (Boulder, Colorado 80302). There are plenty of locations outside of Boulder too, so check to see if you are lucky enough to have a local Snarf’s of your own! When: Order any of the fantastic sandwiches from both Snarf’s in Boulder: Monday through Saturday from 11:00 am to 10:00 pm and Sunday from 11:00 am to 9:00 pm. Contact: Call Snarf’s on Arapahoe at 303.444.3404 or Snarf’s on Pearl at 303.444.7766. Visit their Facebook page or follow Snarf’s (Pearl) on Twitter @SnarfsOnPearl. Full Disclosure: The opinions expressed here are my own. No comps for the chomps. I’m glad I’m not the only one who couldn’t get the Thundercats pronunciation of snarf out of my head! That’s one lovely looking sandwich. Too bad I don’t get to Boulder, well, ever. Enjoy! We have a Snarf’s in St. Louis, and I don’t really know how I ever survived without it. Sometimes I think my love of Snarf’s is ridiculous. After reading your review, I am glad I am not alone in my Snarf’s obsession. Rather than something fancy, I even went there for my birthday dinner last year. Cheese and mushroom is the only sandwich I order. We got a Snarf’s in Longmont an I was embarrassingly excited. I’m an Italian Sub Girl. Love Snarfs! (I’m a turkey and provolone girl myself). I hope you buy the pickled peppers and start to hack them. I had the MMlocal peppers at the farmer’s market last year and tried to replicate them. My attempt was serviceable, but I literally want to drink the MMlocal juice, whereas mine was just ok. In other words, I am still on the hunt for a go-to recipe. I get my snarf on during the non-peak mid day or close to closing times (at the Pearl location where they make them quickly and with love) and it is an act of will power not to rip open the butcher paper during the three minute walk home. Love the Italian and while the Beef/Provolone with dipping juice isn’t up to par with what I grew up with, it sure beats a flight to O’hare and cab ride to Portillos. I hold the onions too! Hi I cracked up at the part about eating with people you don’t like! After your previous recommendation, I recently tried the artichoke and feta sandwich at Snarf’s. Yum! I always get turkey and add avocado. We need to go to Half Fast subs together. When I was a student I ate there weekly (when it was Yellow Submarine and then Planet Sub). I’m curious as to what I’d think going back as a meat eater! And Salvaggio’s? what about Sal’s? 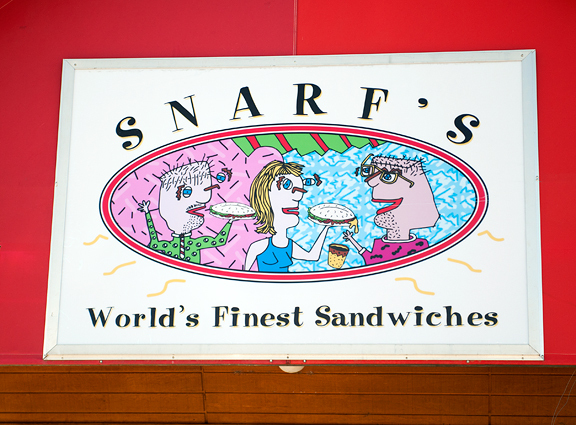 They have Snarf’s in Denver too. There’s one in Capitol Hill right across the street from the Whole Foods. They get fairly busy but not anywhere near as busy as the Boulder ones. The French Dip there is aaahhmazing! LOVE LOVE LOVE Snarf’s. My fav- tuna sandwich. Do they have gluten free bread now? What @Jill said – do they gluten free? *Please* tell me yes, I’m droolin’ here. Would definitely hit up Snarf’s on my next trip home (Denverish). Haven’t found great GF sammiches in Seattle. Love that we can get Udi’s rolls in grocery, GF buns at hot dog and Red Robin, GF pizza several places (fave is Romio’s on Lake City Way). OMG – gonna have to go buy sammich stuff and make own subs for weekend. Love your blog, at least what I’ve seen so far. Gonna Pin the Thai Shrimp Salad. <3 it! Kim – you are definitely not alone! kitty – oh, I really want to. A good summer project, no? Janet – isn’t that good?! Denise – yes, HFS is on the list, but we’re gonna wait until CU is out for summer. I have Sal’s on the list too! Allie – mmm, another one to try! Jill – I don’t know if they have GF bread. Are you GF now?? Rachel – you can certainly call them to find out next time you visit. Oh man, I’m addicted to Snarf’s. My husband and I usually (always) split a turkey and swiss Pro w/ everything. Our new process is to order via the splick-it app so it’s paid for and waiting for us when we arrive. While I would gladly wait 30 min for a Snarf sandwich, using the app has made the whole experience so much easier– and more importantly, gets the Snarf in my belly faster! They just opened one near us, so we’re going to check it out. I had to reread your post and comments so I could consider what to order. It all looks so good!